The sculpture will be created by artist Rick Harney of Bloomington, Illinois. It will be made of bronze and will be life size. 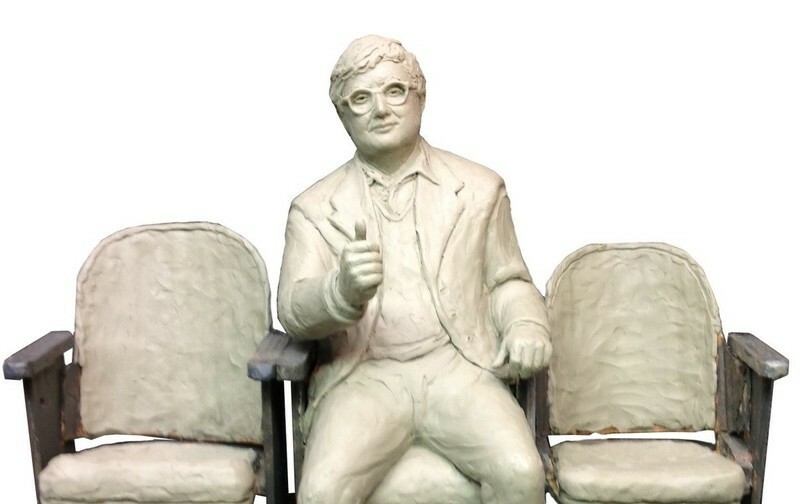 It will depict Roger Ebert sitting in the middle of three theater seats displaying his signature "thumbs up" gesture. Roger's widow, Chaz Ebert, was unable to attend the press conference due to a scheduling conflict, however she selected the composition of the sculpture and is providing the artist input to enable him to depict Roger at the stage of his life which she desires. Many people and entities are contributing to this sculpture effort. These include the cities of Champaign and Urbana, the College of Media of the University of Illinois at Urbana-Champaign, the Champaign Park District, the Community Foundation of East Central Illinois, and the Public Art League. Together, they are hoping to raise approximately $125,000 for the commissioning, building, and installation of this sculpture.Any funds raised in excess of that necessary to complete the sculpture will be be given to: (1) The Roger Ebert Center for Film Studies at the University of Illinois; (2) Ebertfest; and/or (3) The Virginia Theatre as Chaz Ebert directs. One can make donations directly to the Community Foundation of East Central Illinois, or through the web site: Ebertsculpture.org. Donors are asked to designate their gifts for the "Ebert Sculpture". The web site has more information concerning the formulation of the idea, Roger Ebert's career, the artist's bio, the sculpture itself and how to donate.The web site has more information concerning the formulation of the idea, Roger Ebert's career, the artist's bio, the sculpture itself and how to donate.